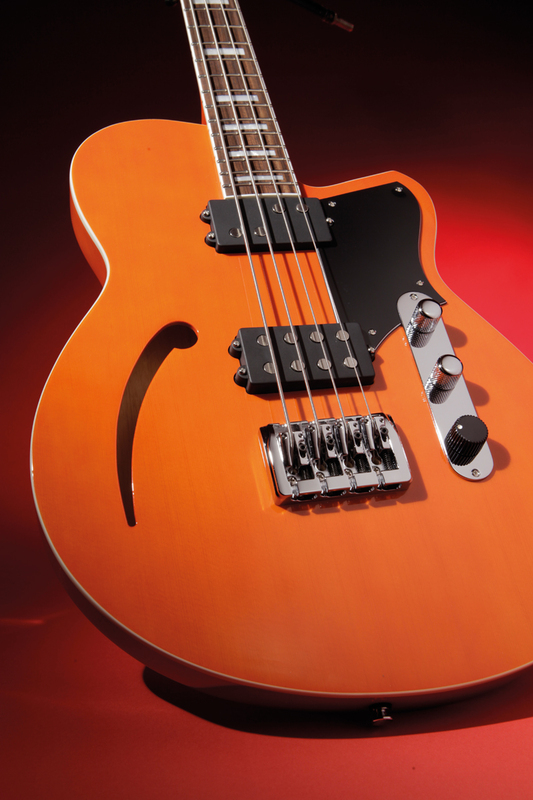 We’ve come across a few interesting semi-hollowbody basses over the last 12 months, firstly in) with the Peerless Retromatic B2 and, most recently, Duesenberg’s Motown Bass. Both were handsome instruments with a single cutaway, and a single f-hole, with the Duesenberg proving itself to be just a little more versatile, albeit at almost twice the price. This month it’s the turn of the Reverend Dub King. Reverend Guitars was established in 1997 in East Detroit, USA, by Joe Naylor, a guitarist who used his background experience in industrial design and lutherie to create distinctive-looking instruments, using many non-traditional materials, with inspiration taken from semi-hollowbody Silvertone models and Gibson’s classic ES-335. Early models had a mahogany core with phenolic laminate back and sides framed by a strip of moulded plastic, and were identical in body shape. Plenty of more traditionally-constructed guitars followed, split into bolt-on or neck-through models. 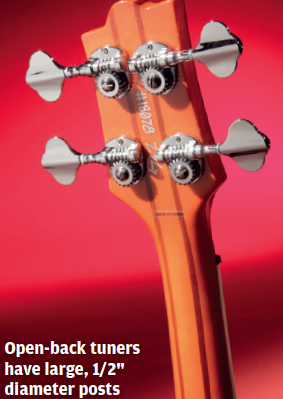 Initially the guitars were distributed to shops in the time-honoured fashion, but Naylor eventually decided to sell direct, making the company more cost-efficient, and in 2006 shifted production from the USA to Korea, where the guitars are manufactured by the Mirr Music Co, thus cutting costs still further. In the Reverend bass catalogue there was first the Rumblefish, a critically well-received and very handsome four-stringer that was quickly discontinued. Never mind, because the Reverend bass roster now boasts eight models, including a signature model made for American bassist/singer/composer Meshell Ndegeochello. Reverend’s Dub King is certainly an extremely fine looking bass and follows the basic template established by our previous victims: semi-hollowbody construction, with solid lower bout and chambered upper denoted by the tell-tale f-hole, and a single cutaway – although the solid chunk that effectively forms the front bout curves subtly back towards the body, almost in the style of a Telecaster, rather simply completing the naturally suggested curve. 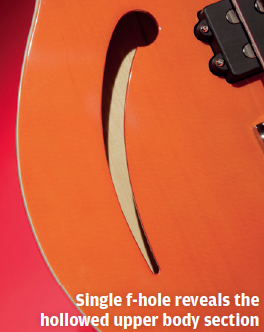 The lower cutaway is nicely recessed for excellent access to the highest fret. The body itself has korina (or white limba), a wood from tropical western Africa with excellent resonance, at its core, the same wood forming the back and sides, with construction completed by the application of a solid spruce top, its subtle grain pattern almost swamped by the cheery ‘rock orange’ finish. Further nostalgic credentials are established by the cream binding strip that separates top and sides, and the way the lower edge of the three-ply black/white/black pickguard tracks the body’s curves is a nice detail. Reverend differentiate their basses by the method used to secure the neck, and the DK comes from the Set-Neck Series (as opposed to Bolt-On). The neck to be secured to the body via mortise and tenon or dovetail joint and a good adhesive. It comprises a five-piece laminate of three chunks of korina separated by walnut stringers, also with cream binding; Reverend describe the neck as having a ‘medium oval’ profile but it’s slimmer and more playable than the name suggests and it feels really easy under the hand, especially with the 30″ scale. There’s a similar look to the headstock as with both Peerless and Duesenberg: it’s a squashed oblong with a half-moon bulge on top, back-angled in the Gibson style, and fitted with a set of chrome open-gear tuners. Rosewood is employed for the fingerboard and it houses 21 medium nickel frets with no tang blemishes, plus a set of old-school pearloid block markers. A sister set of black dots is embedded in the binding along the top edge. Reverend fit their own bridge, a chunky chrome unit with optional top-load or semi-string through facility, where each saddle can be locked down to the bridge’s baseplate, which Reverend say enhances clarity and attack. Adjustments require a small Phillips screwdriver and an Allen key. 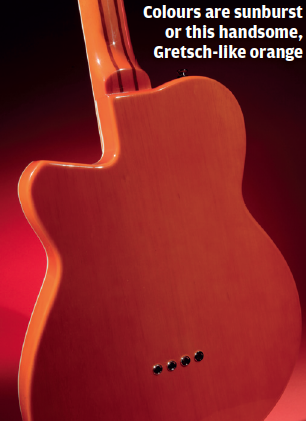 No active electronics here – the Reverend is passive and comes a pair of the company’s own pickups, a Thick Brick Bridge model for ‘warmth’, ‘thickness’ and ‘strong mids’, ‘punchy like an active but more organic-sounding’, and a Split Brick Neck pickup butted right up to the neck, offering ‘strong lows and highs’ plus ‘open mids’. These are hooked up to a line of three potentiometers: two Tele-style knurled chrome knobs for master volume and master tone, plus a black plastic knob which serves as a pickup pan. Visually, it would probably be better with three chrome knobs, as the plastic control cheapens the otherwise classy look. The Dub King balances decently well on a strap. 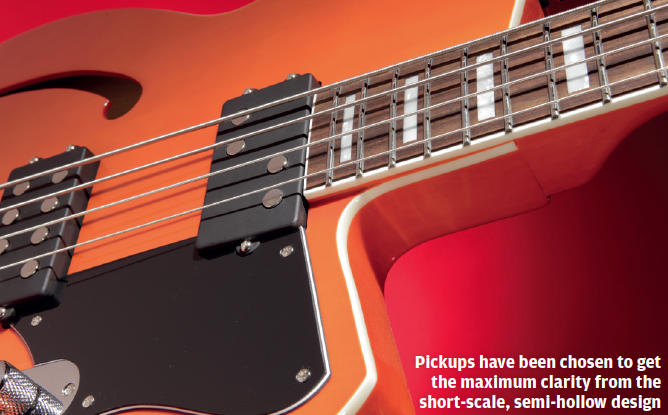 The extra girth and the lack of comfort chamfering endemic in all semi-hollowbody basses takes a bit of getting used to, but it isn’t a serious issue. Plugging in uncovers a warm, thudding tone with lots of harmonic life – not as much zing as a Danelectro, but we’re heading in that direction. The E string has a righteous growl to it and the middle strings have plenty of punch and a raspy clarity, with just about the right amount of high-mid zing for brightness without excessive honk. Responsiveness is pleasingly even across the fretboard, and though the G string sounds just a touch bright to our ears, you could use that to make sure upper-register work comes over clearly. Indeed, there’s plenty of evidence of lively highs on display here – they get a bit honky if you really attack the Dub King, but if you lay back a bit then they speak sweetly. Backing off the tone control reduces the crunchy attack slowly and almost imperceptibly, until just before the dubby morass that is full cut, you’ll find a softer, more rubbery sound with more focus on the fundamentals – great for old-school funk riffs or solid grooving. The choice of a pan control over a conventional three-way switch proves interesting, because you actually do get audible degrees of mix between each pickup. Nudge it towards the soloed neck pickup and you start to get a hint of raspy acousticisms, shifting more obvious air, with a tightening midrange and amplified snarl. Output level is also much louder than in twin-pickup mode, and the extra size puts it squarely in your face – one of those sounds that tempts you into aggressive blues riffing. 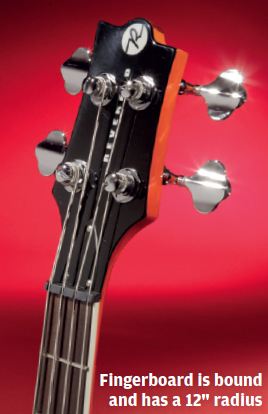 If you chop the tone dial back, the softer notes edges and heavier bottom end thump moves the sound in a rootsier direction, with walking bass styles sounding especially sweet. Soloing the bridge pickup and playing fingerstyle reveals a throaty, bubbling sound that’s sharp and snappy with just the right amount of high-mid gurgle. In truth it’s a bit over-lively, but blending the pan control back towards twin pickup mode gradually reduces the sharpness of attack, while chopping the tone control right back also helps, and the fat, tight end result is well worth it. 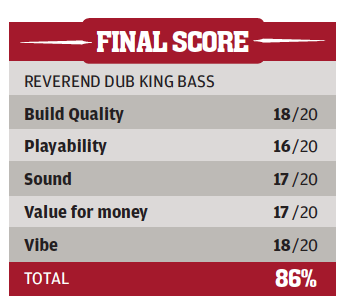 Reverend’s Dub King is a very good little bass, and though you can’t really attack it with contemporary techniques expecting to get the appropriate sound, what’s on offer is fundamentally good. There’s plenty of air in the tone, and this – as well as the stand-out looks – helps push it in a jangly guitar band, old school soul or bluesy direction. It’s well put-together, and though it’s at the higher end of ‘affordable’, if you fancy a lively semi-hollowbody as a main, second or even third instrument, you’ll do yourself a disservice if you don’t check one of these out.